During the first five years of Prohibition in New York, there was one name that struck fear in the hearts of every bootlegger- Isadore “Izzy” Einstein. A man who a 1922 edition of The Literary Digest noted was the “master hooch-hound, alongside whom all the rest of the pack are but pups.” This hooch-hound was a Prohibition agent with a 95% conviction rate and over 4000 arrests, a record made all the more impressive when you realise Einstein was a 5 feet 5 inch tall 225 pound Austro-Hungarian immigrant with no previous background in law enforcement. Born in 1880 somewhere in Austria before immigrating to the states in 1902 seeking a better life, Izzy worked as a clerk in the postal office to support his wife, five children and ageing father. When Prohibition came into effect in January of 1920, the then 40 years old Izzy was amongst the first to apply for a job at the Southern New York Federal Prohibition Bureau. As he said, it seemed “a good chance for a fellow with ambition”. The pay was $40 per week (about $536 per week today). Initially the Bureau was reluctant to hire the Rubenesque postal worker, but Izzy was persistent, telling his interviewer, Chief Agent James Shelvin, that he was the perfect candidate specifically because he didn’t look like a Prohibition Agent. Izzy also added that he knew “something about people- their ways and habits- how to mix with them and gain their confidence.” It also helped that he could speak about half a dozen languages including speaking Yiddish, German, Polish, and Hungarian fluently, and able to get by speaking Russian, Spanish, Italian and French. Shelvin was evidently swayed by Izzy’s argument and put him to work, testing the theory that nobody would suspect Izzy of being a Prohibition officer by sending him to bust a Manhattan speakeasy notorious for being able to spot undercover agents a mile away. So, rather than go undercover, Izzy simply casually strolled into the establishment in full agent uniform wearing his badge and asked the bartender “Would you like to sell a pint of whiskey to a deserving Prohibition agent?” The bartender, assuming it was a joke, poured Izzy a drink before asking where he got such a realistic looking badge. According to contemporary newspaper accounts, Izzy calmly responded, “I’ll take you to the place it came from” and arrested him. Over his first few weeks on the beat, Izzy made several dozen arrests before approaching his superiors asking if they’d consider giving his friend, Moe Smith, a job. Like Izzy, Moe had no background in law enforcement and was similarly built, standing a few inches taller but around 50 pounds heavier. 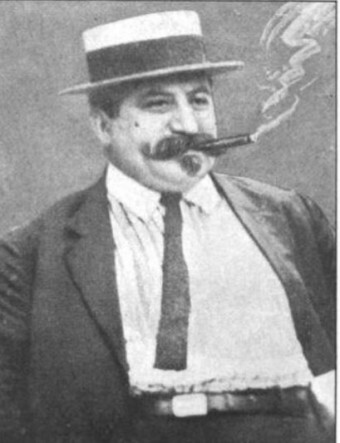 When his superiors asked what possible qualifications an obese cigar store salesmen could have that would help him catch bootleggers, Izzy explained, “He doesn’t look like an agent either”. He got the job. Over the next five years, Izzy and Moe, who the press nicknamed “Tweedledum” and “Tweedledee”, made over 4000 arrests with a reported conviction rate of around 95%, seizing in excess of five million bottles of liquor. Examples of some of the more ridiculous personas adopted by the pair include: Texas ranchers, opera singers, travelling violinists, an elderly Yiddish couple (pictured right), beauty contest judges, pro football players (complete with uniform and helmet) and Chinese launderers. The Jewish pair even once managed to bust a speakeasy in Harlem by convincingly posing as black men over the course of several days. Another bizarre example included the time Moe and a near freezing, violently shivering Izzy walked into a Coney Island speakeasy wearing a sopping wet bathing suit in the middle of winter and exclaimed that he desperately needed a drink or he’d freeze to death. (Aside: Contrary to popular belief, drinking alcohol helps cool your body, not warm it, making freezing to death more likely.) In any event, the ruse worked and Izzy and Moe got their arrest. And just to show his range, Izzy one evening walked into the Yorkville Casino with a trombone under his arm. The false-front shirt, Ascot tie and other infallible markings of the orchestra musician were upon him. He could play the trombone, too, just as on a similar occasion in Brooklyn he utilized a violin to win over the restaurant management. A good fellow, in each instance the charm of his music brought proffers of drinks, which he accepted, and then displayed his gratitude by distributing summonses. Another day found him pushing a fruit-cart in the Bronx. His equipment was real. There was nothing stagy about it. The soft felt hat, the bandanna, the corduroy trousers, all blended with the rickety two-wheeled vehicle to convince the two score saloon keepers upon whom he called in one day that he was the genuine fruit peddler. As with other selling ruses of Izzy’s, his fruit was good and the price was cheap- not too cheap, because that would excite suspicion. The exceptional bargains he offered in his rounds of the combination saloon and lunch counter places made him welcome and at the opportune moment in each transaction the request for a return favor was made. In each case where it was granted there was an arrest. It takes a little finesse. The main thing, it seems to me, is that you have to be natural. The hardest thing an agent has to do is to really act as if he wanted and needed a drink. That doesn’t mean you can walk in with the stock excuse of a toothache. They’ve got stung on that story so many times a man could roll over and die of it on the saloon floor and never get a drop. 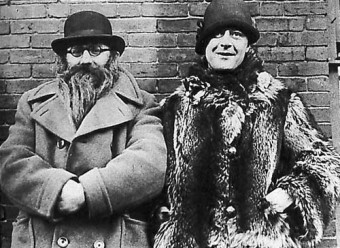 Beyond their skill and ability to gain people’s trust quickly, unlike many Prohibition officers, Izzy and Moe were seemingly incorruptible, flatly refusing bribes and openly inviting the press to oversee their busts. In regards to the latter, the pair would notably schedule their major busts for times that would be most beneficial to the tabloids (usually the weekends so they had something to print on Monday), even inviting photographers and journalists to tag along as they went about their duties. Along with encouraging the duo to don more flamboyant disguises to keep the press interested, it also made them more brazen with the pair frequently arranging to bust several dozen speakeasies in a single night clandestinely followed by a flock of reporters. Izzy and Moe’s exploits were such that other cities began making requests to the New York Police Department for their services, which it complied with as a “gesture of goodwill”. While touring the country, Izzy had a standing bet that he could catch a bootlegger within 30 minutes of getting off the train. The Bureau of Alcohol, Tobacco, Firearms and Explosives claims that Izzy only failed to deliver on this promise once, in Washington D.C. They also noted that on one occasion, Izzy and Moe astounded even themselves when they climbed into a cab in New Orleans directly after getting off the train and asked the driver if he knew where to get a drink. The driver dutifully offered to sell the men a tot of whiskey and was immediately arrested. They’d been in New Orleans mere minutes. Though their flair for theatrics and use of disguises became the stuff of legend amongst the press, law enforcement and criminals, Izzy maintained that his favourite bust was a time he walked into a speakeasy with no disguise and saw a giant picture of his own face on the wall surrounded by stories of his exploits. Curious to see if anyone would recognise him, he stood below the photo for several minutes making the same expression. Nobody noticed him until he pulled out a warrant and explicitly made his presence known. The pair’s “vaudevillian” tactics, despite earning them the kudos of the press (and if you’re curious, see: What’s a Kudo? ), riled the wrong people within the Bureau who resented the publicity their antics brought and how incompetent Moe and Izzy’s arrest record made other agents look. As a result, in 1925, both men were fired as part of a “restructuring” of the force. Izzy later claimed in his book, Prohibition Agent No. 1, that one official berated him saying, “You are merely a subordinate-not the whole show.” (Interestingly, Moe was not mentioned once in that book outlining the pair’s exploits. Izzy claims that was at Moe’s insistence. Possibly true, the pair seemed to remain on friendly terms long after the book was published.) Izzy also claimed he was offered a transfer to Chicago, but turned that job down as he wasn’t interested in going up against Al Capone. After being let go, the pair used their people skills to become quite successful insurance salesmen. Izzy ultimately died of complications from surgery after having his leg amputated (possibly needing this done due to diabetes) in 1938 at age 58. Moe fared better, living to age 73, dying in 1960. Despite some danger in their profession, neither Moe nor Izzy ever carried a gun while on duty. 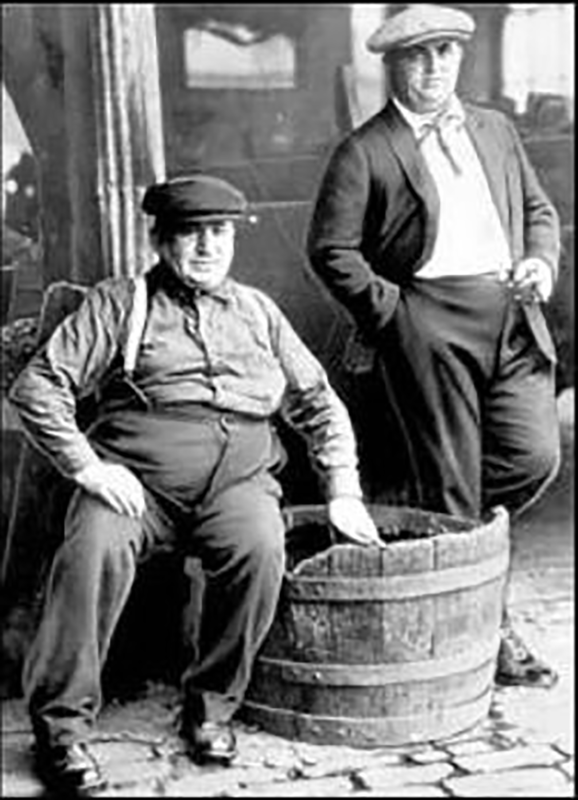 Although they enforced Prohibition with near unrivaled zeal and dogged determination, neither Izzy nor Moe supported it in principle, instead feeling that their job was simply to uphold the law, regardless of whether they agreed with it or not. I wonder if they enjoyed the booze while on duty. They had to taste it to assert it was really alcohol before the arrest.